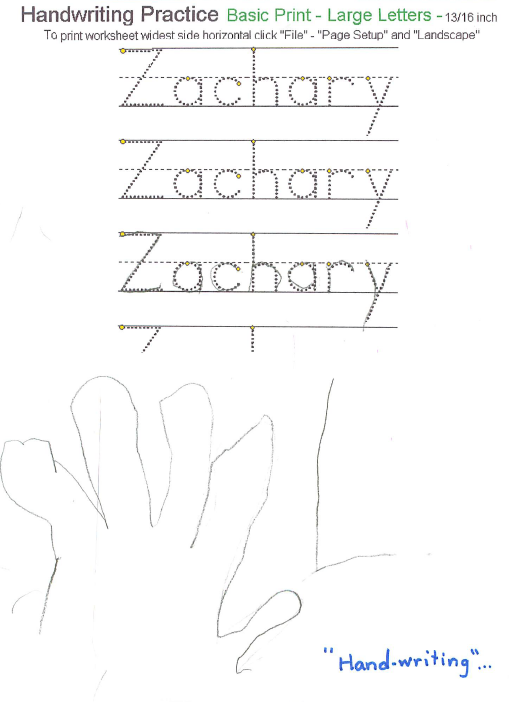 Zach was in pre-school the other day and the teacher went around handing out sheets of lined paper. She told the whole class, "Class, now we are going to do some handwriting exercises". 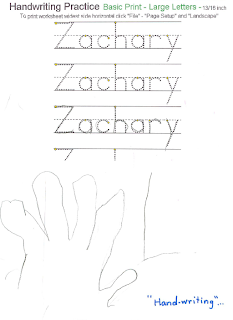 Zach takes his pencil with his right hand and then puts his left hand on the paper and starts to trace his hand. The teacher asked him what he was doing and he responded, "Handwriting". Mommy, Daddy and Zach were at lunch the other day and Zach tried to steal a chip off of Daddy's plate. Daddy blocked the attempt and Zach was upset. Daddy: You cannot just take others food without asking. Zach: I DON'T WANT TO EAT ANYTHING! I AM NOT HUNGRY! Zach: YOU DID NOT LET ME FINISH MY THOUGHT! Daddy: You can have a chip if you apologize for this outburst and ask nicely. Zach: (more mumbling) I am sorry. Daddy: Well that is not going to get you any chips. Zach: YOUR TALKING MAKES ME TIRED! (5 mins of more nonsense). I am sorry for being disrespectful. Can I please have a chip? Bubby: How many children do you want to have? Bubby: I guess that he only wants an even number of kids. Mommy wakes Tessa up for school. Tessa stares at her closet for 30 minutes pondering the perfect clothing ensemble. Mommy comes in room and forces Tessa to choose an outfit. Tessa must, must, must have her hair done with a straightening iron and preferably several cute barrettes. Tessa dictates her breakfast, lunch, and snack to Mommy. Each meal must only consist of healthy food, no milk, and lots of water because "that is what your body is made of all the way up to your chin." Should Mommy fail to comply with said rules, she will be severely reprimanded later. Tessa is lucky if she arrives at the bus on time. Tessa returns from school and asks to play with Kayla. Hurricane Kayla and Tornado Tessa destroy at least two rooms in the house. Mommy tells Tessa and Kayla to start cleaning up. They start cleaning up. Mommy returns later to find Tropical Storms have hit the same rooms. There is no possible way to clean the mess before Kayla leaves. "I CANNOT CLEAN THIS UP BY MYSELF!" "YOU NEVER LET ME DO ANYTHING I WANT TO DO!" "YOU NEVER TAUGHT ME TO CLEAN UP ANYTHING BY MYSELF!" "THIS IS GOING TO TAKE 8 HOURS!" "I NEED TO EXPLAIN IT TO YOU, BUT YOU KEEP INTERRUPTING!" "I CAN'T GET TO THE TOYS IN THE CORNER BECAUSE IT IS TOO MESSY!" Or Daddy's favorite: "THERE IS TOO MUCH STUFF TO CLEAN UP!" All excuses receive the following response: "Then we will have to donate it to someone who can clean it up." For more information, see "tantrum" blog post. Bedtime is only possible by making a path to the bed between the toys that she has been "working on" cleaning up for the past 3 hours. Tessa: Mommy, I know what I can do to help me stop sucking my thumb. Tessa: I can wear gloves all the time. Mommy: How about just when you are watching TV or sleeping? Tessa: And when I have quiet time. I worry about sleeping during nap time. Mommy: What do you worry about? Tessa: Snoring. I don't want to snore and wake up the others. Daddy: You don't snore. I know because I've listened. Tessa: That's annoying, isn't it? Daddy: Yes, yes it is.